Did you guess mustard? Perhaps my photo threw you off. While my answer would be mustard, that's net even close. Did you guess ketchup? Great guess, but ketchup isn't even in second place. I'll give you a hint...if you order America's best selling condiment on your hot dog, I will reluctantly put it on your dog, but it will go on the bun before the hot dog. Why, because I don't even want to see it (let alone have other customers see it) so I'll hide it as much as possible. I dislike this condiment so much, I'm not going to tell you the answer here. You'll have to click this link to find the answer. If you want this condiment on your hot dog just ask, but please don't ask me to put it on top of the dog. We aim to please (which is why we will put ketchup on a hot dog even if you're more than 8 years old), but we don't have to like it. 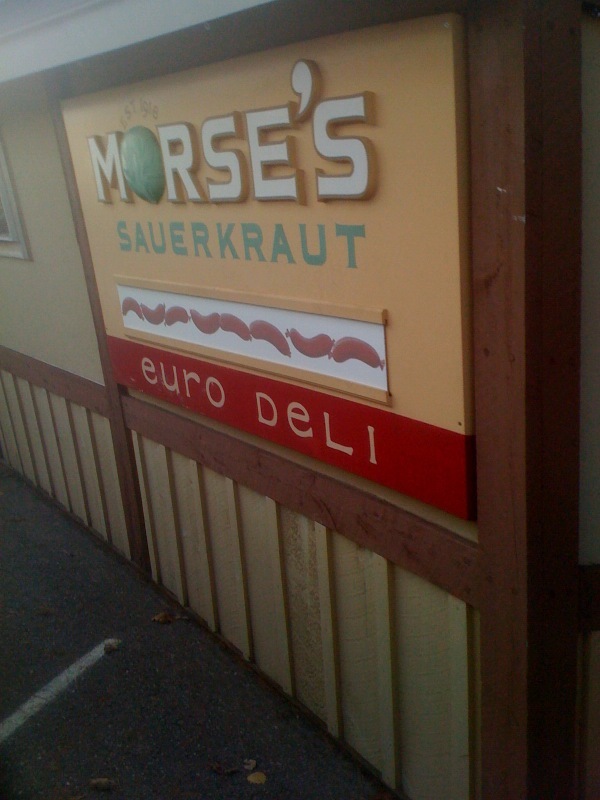 Frankly, we serve the BEST mustard! Frankly, The Hot Dog Man did a great job! In a fight over the best hot dog, Sara Lee (maker of Ball Park Franks) and Kraft Foods (maker of Oscar Mayer) have taken their BEEF to the courts. The arguments center around a hot dog taste test which Oscar Mayer claims to have won. 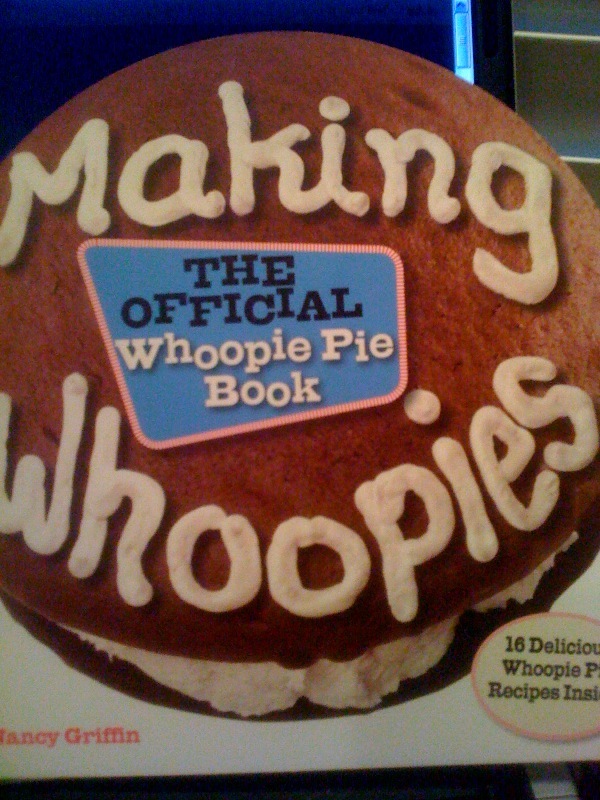 Sara Lee has claimed that the taste test was deeply flawed for a variety of reasons. My questions is this...How can you possibly have a national taste test for the best hot dog and leave out the very best hot dog made by Hummel Bros. for Yank's Franks? I have had many Ball Park Franks and many Oscar Mayer Wieners. 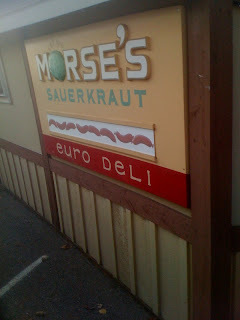 Those hot dogs are very good, but they are not even close to Hummel Bros. No wonder they kept Hummel out of their test. Photo courtesy of The Hot Dog Man and his fancy schmancy camera. 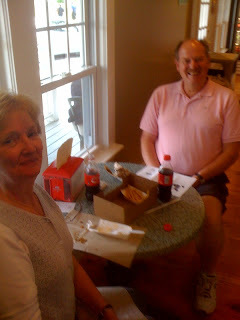 The Hot Dog Man and his wife, Mrs. HDM set out on a tour of Southern Maine and his first stop...you guessed it, Yank's Franks. The Hot Dog Man pulled into the Yank's Franks parking lot at about noon last Friday. He and Mrs. HDM unloaded their fancy, schmancy video equipment from their vehicle and proceeded to snap photos and conduct interviews for his Yank's Franks review. Frankly, we can't wait to see the final result. 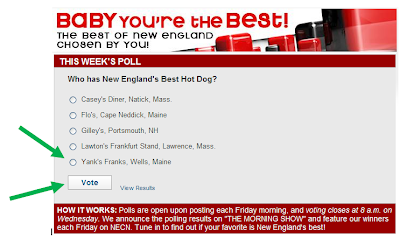 Yank's Franks takes second place in the voting for New England's Best Hot Dog. Not bad for a "hot dog joint" that opened less than a year ago. Yank's was up against some of the toughest competition in New England. Connecticut alone is home to some amazing hot dog joints (after all it was a Connecticut Hot Dog Joint that was the inspiration behind Yank's) scattered all over the State. 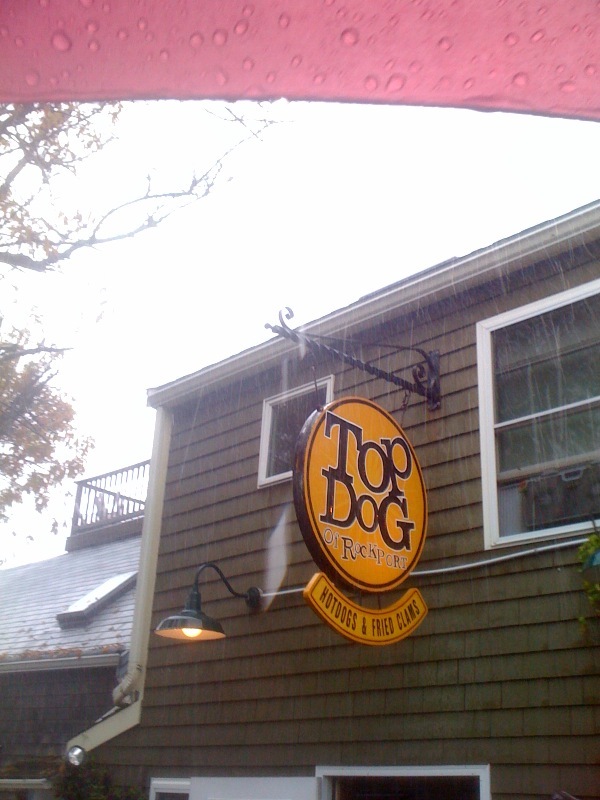 Rhode Island has great places and has their own method of serving dogs, oddly enough called New York System Weiners. Yank's Franks customers from Rhode Island rave about them. Maine has the old stand by Flo's one of this year's nominees and winner last year. 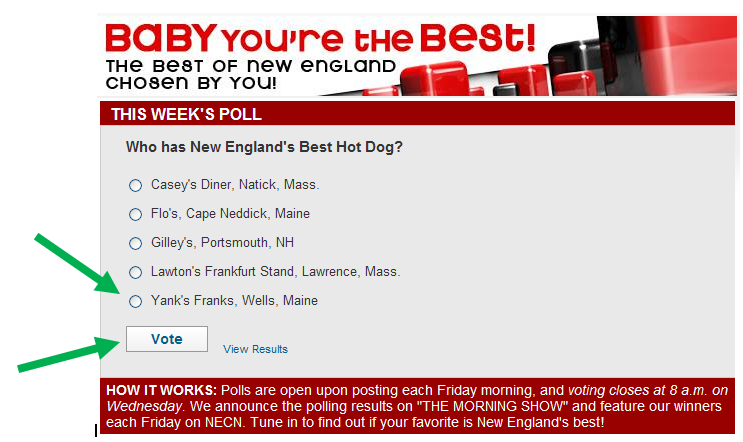 Anyway, this isn't about the other hot dog joints, this article is about the wonderful people that voted for Yank's Franks in this year's NECN poll , Baby You're the Best! Thank you all for taking the time to vote for Yank's Franks, it is very much appreciated. Frankly, Yank's Franks has the BEST customers! After less than a year in business, Yank's Franks is up against some very tough competition to become The Best in New England. If you enjoy Yank's Franks hot dogs, please go to his link and vote for Yank's. It would be amazing to win. With your help, it could happen. Our competition has many years of devoted customers, and they are all amazing "Hot Dog Joints." We've got our fingers crossed. Thanks to all that nominated Yank's Franks. 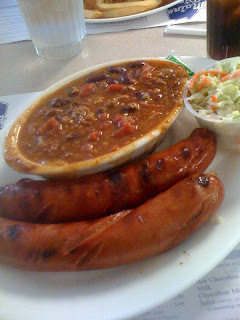 Popular Maine Food Critic and blogger of Life in Maine, Chubby Werewolf has written a review of his recent visit to Yank's Franks. Chubby not only writes about his opinion of the hot dogs (pictured is the Yank's Frank that Chubby enjoyed), but he also gives a great description of Yank's almost famous Pulled Pork sandwich. Check it out! If you are living in Southern Maine or visiting the Greater Portland area, do yourself a favor and read Chubby's articles on What To Do and Where To Eat. 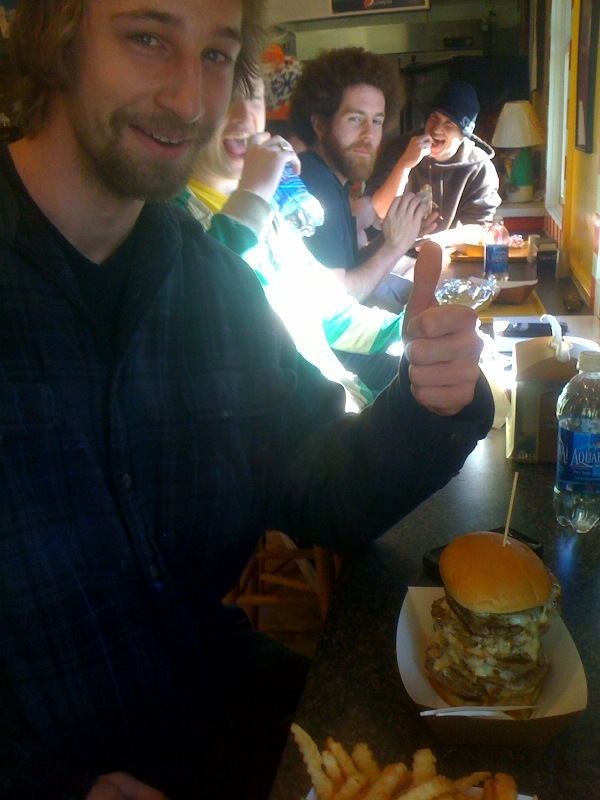 If you follow Chubby's suggestions, you will greatly enhance your Southern Maine experience. If you're a Foodie and enjoy a perfect burger, Chubby devotes an entire section (Burger Watch) to his efforts to seek the ultimate burger. Warning - proceed cautiously through this section if you are hungry. Thanks, Chubby for the great review. We are so happy you enjoyed your lunch. Frankly, I Love Working at Yank's Franks! We Meet The Nicest People. He's back! One of the authors of the very popular Hot Dog Blog, The Hot Dog I Ate, Mike returned to Yank's Franks today with his lovely wife, Samantha. (and this time it wasn't by accident). As you may recall, his last visit was a result of a surprise sighting of Yank's by Samantha during their journey north. The bad news, at that time, was that they had stopped a short while earlier at Flo's for some dogs. Being a true "veteran hot dogger" that wasn't going to totally stop Mike. He found room for one Yank's Frank. On this trip Mike had Yank's Franks as the destination and we were thrilled. After Mike and Samantha finished their meals the customer traffic slowed as if on cue. We had some time for some "hot dog talk" and just to visit. Both Hot Diggity and I are now into our 3rd careers and the great thing is that "Hot Doggers" are the absolute best people. Thanks for stopping Mike and Samantha! Frankly, Hot Diggity and I love being Hot Doggers! It's been a long while since the Yank's Franks test kitchen has been open, but we had a special reason to unlock the doors and fire up the cooking equipment. As you (hopefully) read in my previous article, we were recently visited by Chubby Werewolf and he came to Yank's bearing gifts. On the menu for the testing were Zweigle Red & Whites and Skyline Original Chili. Both were products we were excited to sample. Double Dog Dennis, The French Fry King and I were all present. Unfortunately, Hot Diggity was unavailable as she was visiting her 8 month old grandson, The Hot Dog Cowboy. 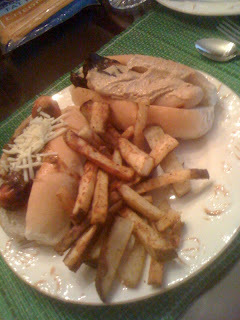 As you can see from the photo (above), the Dogs were served on buns that are not typical of Yank's Franks. They were given to us by our baker, Fantini Bakery to test out. Also, what Hot Dog Tasting could be conducted without fries? So, it was homemade Cajun Fries to keep The French Fry King smiling. And, it was One Red and One White Zweigle's for each of us to keep Double Dog Dennis happy. What kept me happy? I started with two vodka martinis. That'll do it. 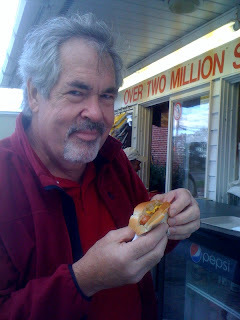 I had my Red Dog with Cincinnati-Style Chili and My White Dog with my favorite mustard, Kosciusko. The Dogs...both of them were absolutely delicious. To me, the look of the White Dog was a bit scary. While I have tried White Dogs at Heid's of Liverpool, that was over 30 years ago. If you have never had a white dog, give it a try. They are awesome! Onto the Chili. 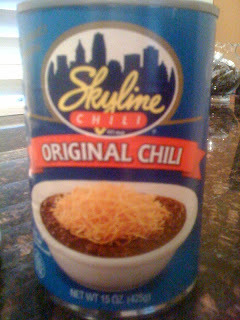 The Skyline Chili is what I was really looking forward to as I have heard so much about it. The first thing I noticed was the aroma. I have opened several different brands of chili from cans, and have been consistently repulsed by the odor. Not at all true with Skyline. While the aroma was subtle, it was pleasant. The next obvious characteristic is the consistency. It was very soupy. 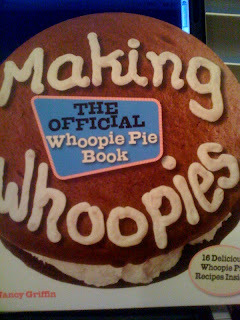 I didn't know what to make of this as I worried it would be too runny for a hot dog topping. In the ingredients list on the can, listed first is beef (which I think means beef would be the ingredient most prominent). I continue to be skeptical that beef deserves top billing. And finally the taste. The Cincinnati-Style Chili was delicious. It definitely reminded me of Mexican Mole (which I love) as it has a hint of a chocolate flavor. Good Mexican Mole just has a hint of chocolate...so little that you almost have to concentrate while tasting to get it. The same is true of this chili. After having the Chili on my hot dog, I had more with just a spoon. Awesome Chili! So good that our Annual Cross-Country Hot Dog Tour may include a swing through Cincinnati. As to whether Cincinnati Chili makes its way onto the Yank's Franks menu is still undecided. The consistency makes it a messy and difficult topping. It also bothers me that people would know if served a chili that spent time in the can. I have always considered chili in a can as wrong. We'll see. Maybe that trip to Cincinnati will give us a different perspective. I'll let you know. A special Thank you to Chubby Werewolf for this fantastic meal. Frankly, Yank loves Chili Dogs! We had a special visitor today at Yank's Franks. It was a great way to begin the day, meeting someone that writes an amazing blog focused on, among other things, one of my favorite subjects...food. Chubby Werewolf himself showed up early this morning and introduced himself to Hot Diggity. While I was at the grill, I heard his discussion and I was so excited. Chubby and I had corresponded shortly after his first visit to Yank's last year. This time Chubby came bearing gifts, and awesome gifts they are. A couple of cans of Skyline Chili (Cincinnati-Style Chili) and a package of Zweigle's Red & White Hot Dogs. 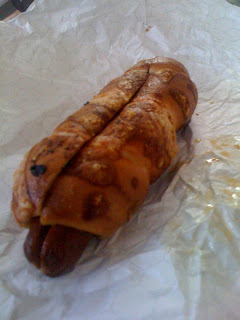 Okay, Chubby really writes a great blog, but boy oh boy does he know what to bring a "hot dogger" for a gift. Thank you so much, Chubby. Hot Diggity and I have a special dinner planned with some "hot dog" friends and I have already told them what's on the menu. Now, we're all excited. Frankly, Yank & Hot Diggity have met some fantastic people! We would love to see you at Yank's Franks to celebrate National Hot Dog Month. Try a different combination of toppings each day. Let us know your favorite. Someone recently ordered The Angry Dog topped with Onions and Jalapenos. It sounds delicious, but I may wait until October to try it myself. BBQ Pulled Pork in Wells, Maine??? BBQ purists will scoff, but hold on Bubba. This BBQ was conjured up in Texas and you can taste it in every bite. 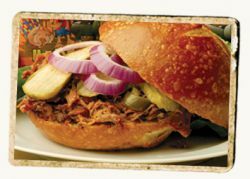 Yank's Franks serves a BBQ Pulled Pork Sandwich with Award Winning, DennyMike's BBQ Sauces. Whether you choose your sandwich sweet or spicy you will be coming back for more. If you're are afraid to try our spicy sandwich, made with DennyMike's Hot'n Nasty, don't be. It has a kick, but it's also very smooth. Don't let the name fool you. Ask us to top it with dill pickle slices. If you like a little more spice (oh yeah!) ask for the Jalapenos on your sandwich. Either way, you can't go wrong. So there you have it, a little bit of Texas right here in Southern Maine. It's Yank's Franks and DennyMike's...giddyup! Frankly, our BBQ is amazing! 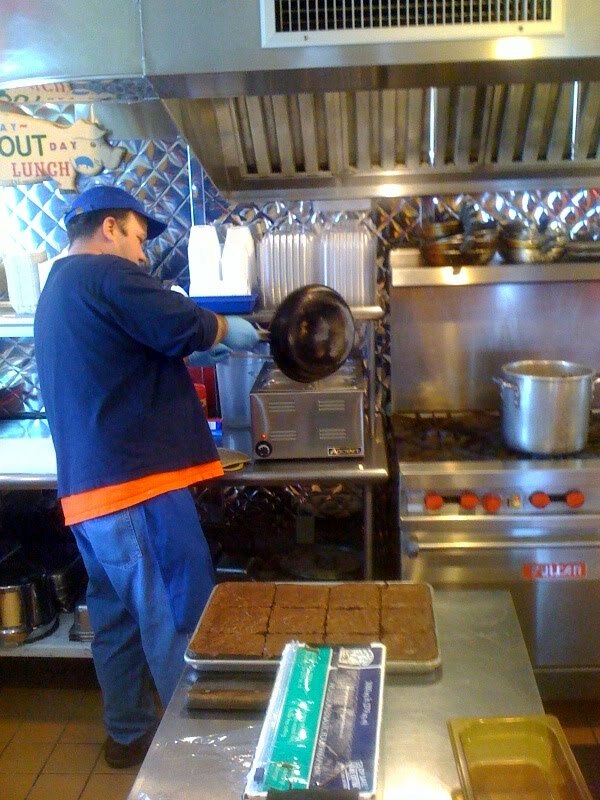 Yank's Franks is open and the Hot Dogs are movin'. Hot Dog season has finally started. 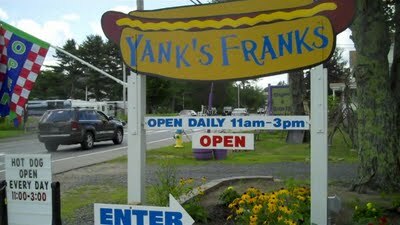 On a hot summer day, nothing goes better than a delicous "Yank's Frank." It's a perfect Hummel hot dog gridddled up and resting on a buttered and toasted, NE style bun. 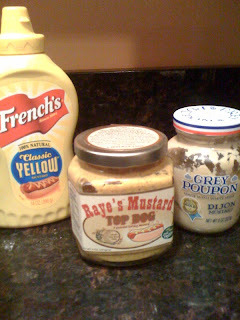 We'll top it with Rayes DownEast Mustard, sweet relish, onions, a slice of tomato and a slice of dill pickle. All this finished off with a dusting of celery salt. It's a smorgasbord happening in your mouth. Don't forget to get a Yank's Root Beer (we now make a diet Root Beer...many of you asked, we listened). It's Father's Day. Is your dad one of those guys who already has everything? Well, I bet he doesn't have a Yank's Franks Gift Certificate. 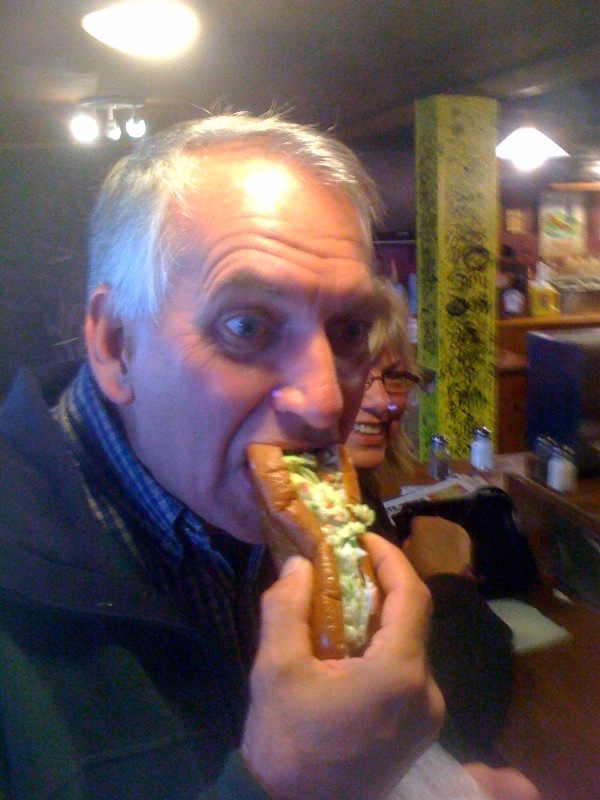 I've never met a great Dad that didn't love hot dogs! 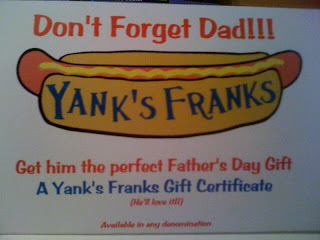 Stop by Yank's Franks this weekend and get Dad the perfect gift. While you're at it, get yourself a hot dog and an order of onion rings. Frankly, we have a great Father's Day gift! 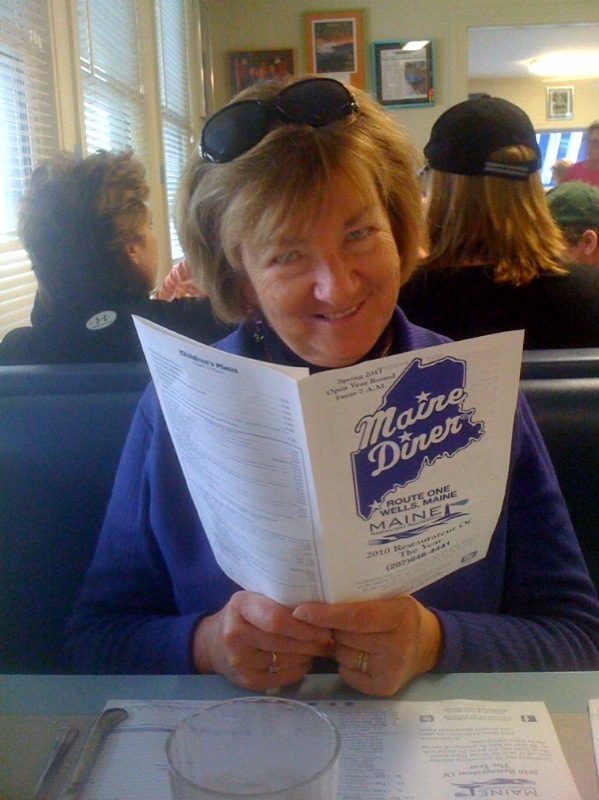 Take a trip to Old Orchard Beach and don't miss Hoss & Mary's Tasty Grub. 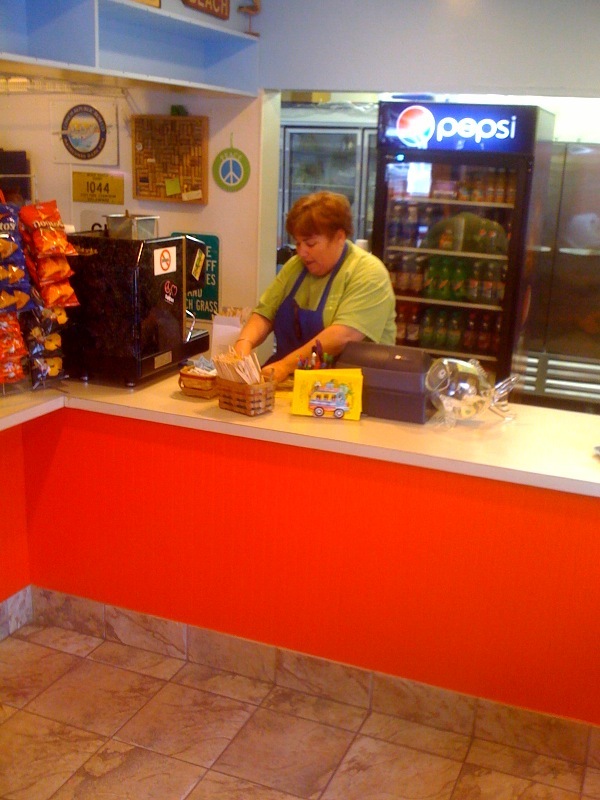 Hoss & Mary's had their pre-opening today and their official opening is tomorrow. Three fourths of the Yank's Franks research crew, Double Dog Dennis, The Hot Dog King and I traveled north in anticipation of some "tasty grub." We entered Hoss & Mary's new restaurant (they used to operate Tradewinds Cafe) and we were overwhelmed. What a fantastic place and it's on the beach. As they advertise, Hoss & Mary's is, "In the shadow of the roller coaster!" As for our expectations of the tasty grub, we talked about it all the way home. It was awesome. Double Dog Dennis got a cheeseburger and fries ( a little boring DD) which he thoroughly enjoyed. The Hot Dog King decided on The Foghorn Leghorn, a cheeseburger topped with chicken fingers, lettuce, tomato and mayo. He is known as The Hot Dog King, but had I been a little more patient in assigning him his hot dog name, he would have been The French Fry King. Needless to say, he selected and loved the fries. For me it was The Moultron, a sandwich named after another of Hoss & Mary's faithful customers(and obviously a foodie genius). My sandwich was simply a cheeseburger topped with a grilled hot dog. I added mustard to make my sandwich the little piece of foodie heaven that I am still dreaming about. My fries were excellent, but that sandwich...WOW! It's definitely worth a trip up to Old Orchard Beach. 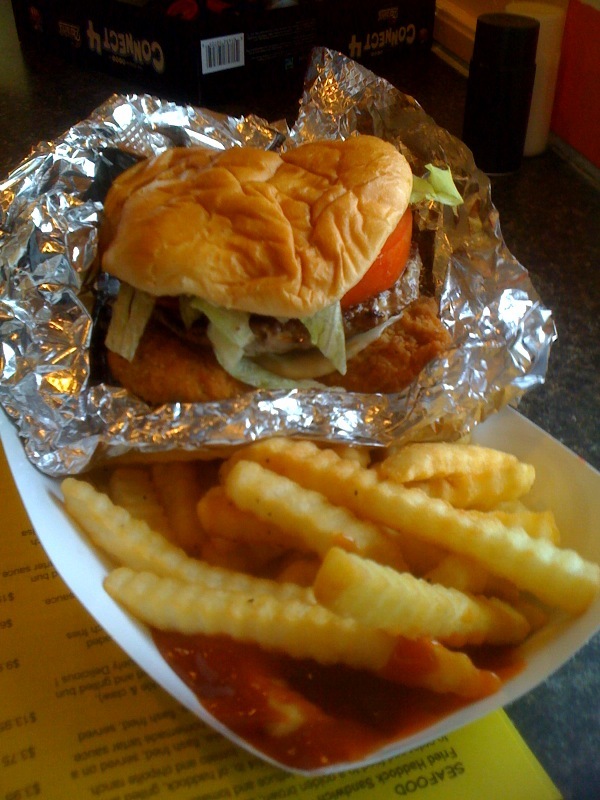 Enjoy the rides, enjoy the beach...but you have to eat at and enjoy Hoss & Mary's Tasty Grub. Their menu has something for everyone and from the comments and observations of everyone that showed up today, everything is just amazing. Frankly, the Yank's Franks research team knows where to dine! Hot Diggity and I were invited to Boston today to speak with representatives of Chicago's Legendary, Vienna Beef. The purpose was to discuss whether Vienna Beef Hot Dogs would be a good fit at Yank's Franks. In addition to the Vienna Beef rep. we were warmly greeted by Grady, the founder and owner of Windy City Eats, the awesome Weymouth, Mass. hot dog joint that serves nothing but Vienna Beef products. 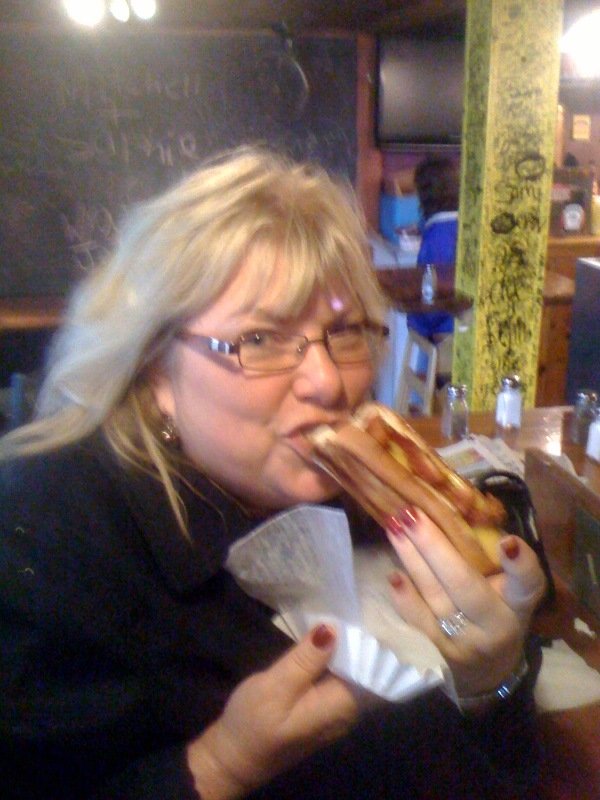 Hot Diggity and I thoroughly enjoyed a Windy City authentic Chicago Dog at last year's Hot Dog Safari. 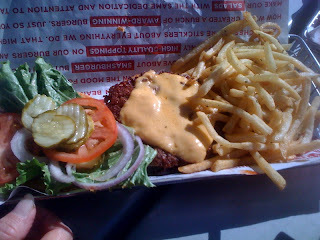 That Chicago Dog was easily the highlight of the Safari. In addition to hearing some of the benefits of Vienna Beef and their products, Grady from Windy City Eats had prepared for us some of his delicious Hot Dog Chili and Spicy Polish Sausage. Both were exceptional. All this is what's known as food for thought. Frankly, Yank's Franks serves the BEST dogs! What a nice afternoon that Hot Diggity and I had. While cruisin' through Perkins Cove, we stumbled upon a great little coffee shop. We aren't ones that can pass up a coffee shop especially when it comes with a million dollar view (inflation adjusted, it's a 5 million dollar view). There it was sitting right on the open ocean, Breaking New Grounds Coffee & Tea. What a find! 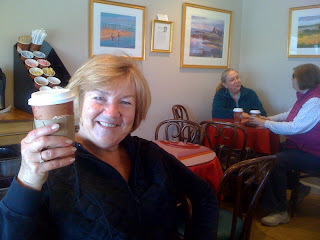 The coffee was superb, the ambiance was unbeatable and the friendly staff made the visit all the better. This is an official Yank's Franks recommendation...if you're a local, get there before the season kicks into high gear. If you're visiting for summer vacation, plan on a trip to Perkins Cove (you'll probably go there anyway) and keep your eyes peeled for Breaking New Grounds. 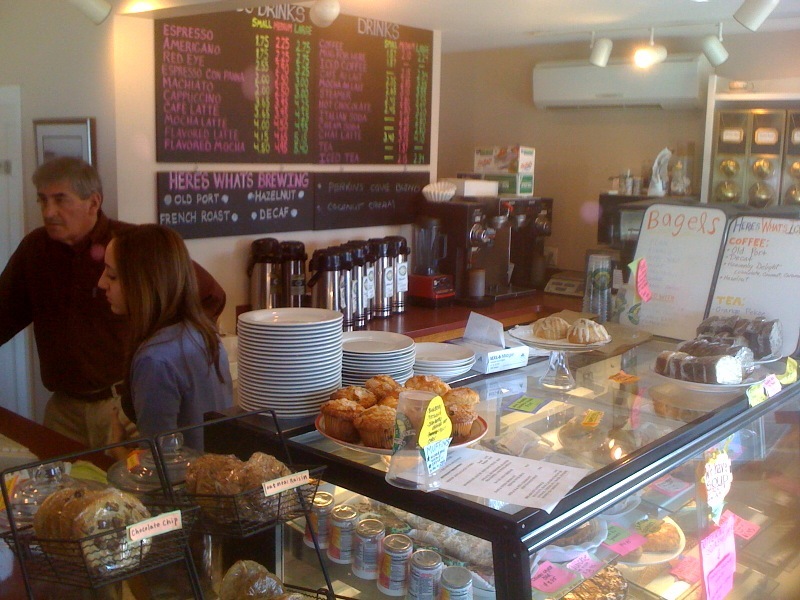 The chief Barista, Ed tells us that in the summer there are Adirondack chairs out on the rocks for customers to enjoy. 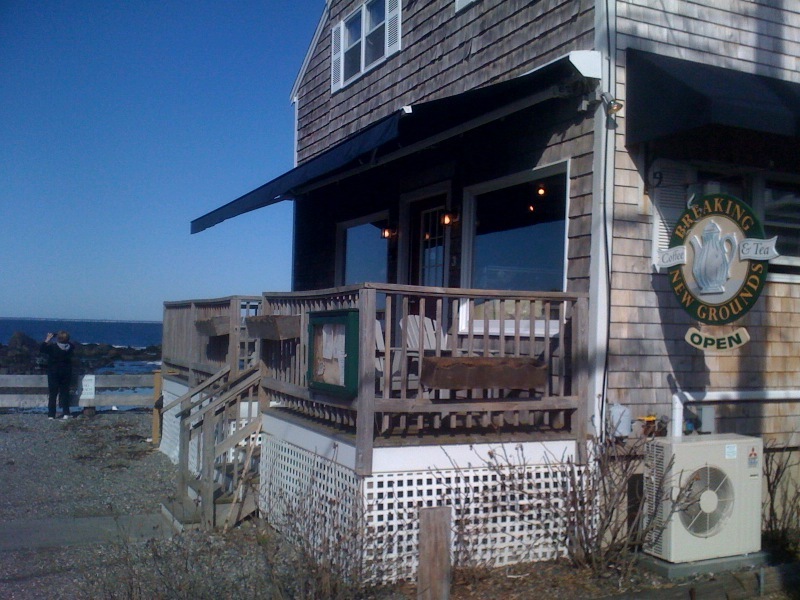 I'm telling you, not only will you enjoy their coffee (their bagels and pastries looked amazing), but you'll have a chance to live like a millionaire lounging on the rocky Maine Coast. Breaking New Grounds has all the specialty coffee and tea drinks you could want and there's a bagel or pastry for every taste. 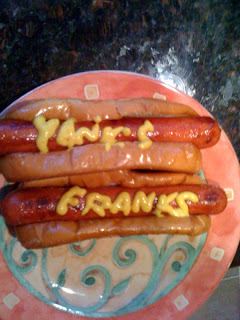 Frankly, Yank's Franks serves the BEST dogs! 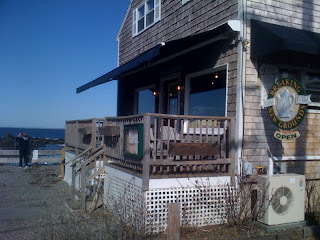 But, we do love our coffee especially when it comes with a magnificent ocean view. 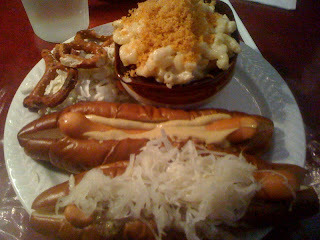 Have You Eaten At Yank's Franks Lately? That's what people will be asking their friends when they taste the new toppings at Yank's Franks this year. Let me back up a little. I have been wanting to find a special, Yank's Franks Sauce to top our hot dogs. People love our Ridge Relish, it's delicious. People love Flo's Relish, but while it's good, it's not for me. People love the Zun Relish at Edgar's Olde Mill Burgers, but that's not what I put on his awesome burgers. Sometimes I feel a bit frustrated, but searching for just the right combination of flavors that I would call my absolute favorite has been a very tasty mission as well. That search has finally paid dividends (can you tell I'm an accountant?). I stumbled upon a small creator and purveyor of mustards, relishes and other sassy sauces. W.O. Hesperus Co. 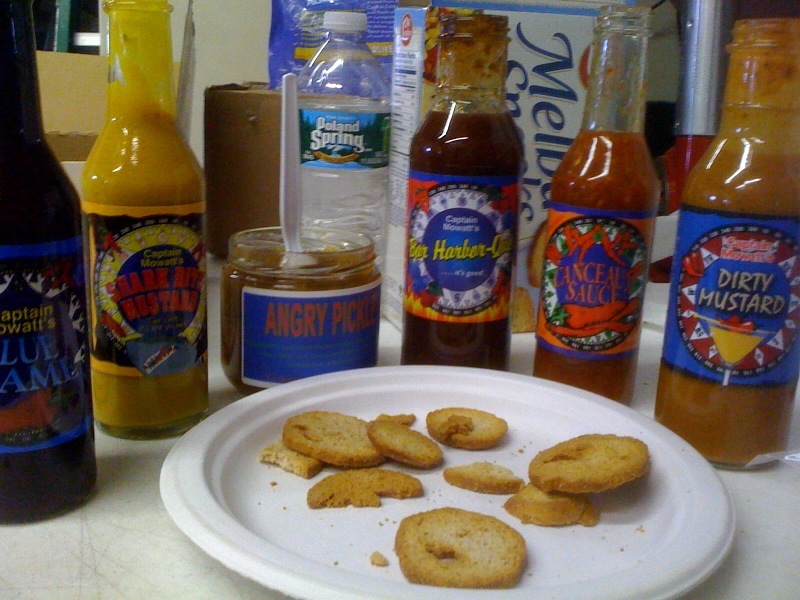 Right here in Southern Maine, they create some of the tastiest condiments you'll ever eat. The genius behind these condiments, Dan Stevens has taste buds that were trained on New Orleans cuisine. When he returned to Maine, he soon found that if he wanted truly amazing sauces, he would have to make them himself. That's what he's doing and Yank's Franks will be a beneficiary of that determination. The local tasting team of Hot Diggity, Double Dog Dennis, The Hot Dog King and I headed out for yet another tasting field trip. We tasted relish (with red chiles and seaweed), and we tasted mustard (with cayenne pepper and Garlic). We tasted Dan's fantastic Canceaux Sauce, that has won so many awards Dan can barely keep up with adding them to his website. 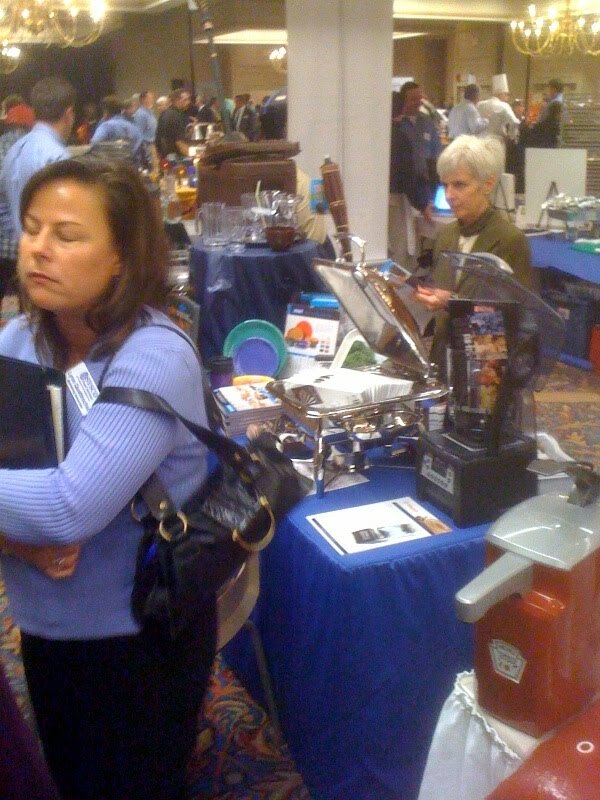 And, we tasted his Bar Harbor-Que Sauce, a tangy sweet BBQ sauce that is so well balanced everyone will love it. After tasting so many unbelievable condiments, my mouth and taste buds were kicked into neutral. Another taste would have been futile. Yet there was one more sauce that I had to try. The Boston Red Sauce is a must for a kid from Boston. I took a bottle to go. 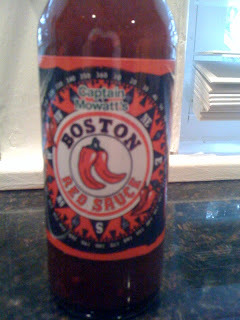 So, here I am sitting at my computer and I am going to the test kitchen to give the Boston Red Sauce a try. I'll be right back. Okay, I'm back. Hang on, I've got to go get a drink of water. I'm sorry, I didn't even warn you, I went for more water and I brought the bottle back with me. No more interuptions. The Boston Red Sauce is awesome, but it is very hot. We may offer this at Yank's Franks this coming season, and I assure you that anyone requesting it will be told that it is delicious and very hot. It's been one of the best and most rewarding field trips we have taken and we didn't have to go very far. Now, more than ever, we can't wait until our season begins. The new toppings we select as a result of visiting the W.O. Hesperus Co. are going to be awesome. Frankly, we serve the BEST dogs...and we serve the best toppings! 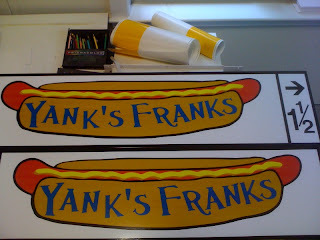 At Yank's Franks, 2011 is The Year of the Hot Dog. Confirmed by, Every Day with Rachel Ray editor-in-chief Liz Vaccariello, she says, "I am personally excited about this...I am a hot dog girl!" While July is National Hot Dog Month and the summer is hot dog season, right now is Hot Dog Spring Training. Loyal baseball fans are flocking to Spring Training Camps to view pre-season games, meet the players, get autographs and eat hot dogs. So, there's no question, 2011 is gonna be big in the Hot Dog World and the season is getting off to a great start. 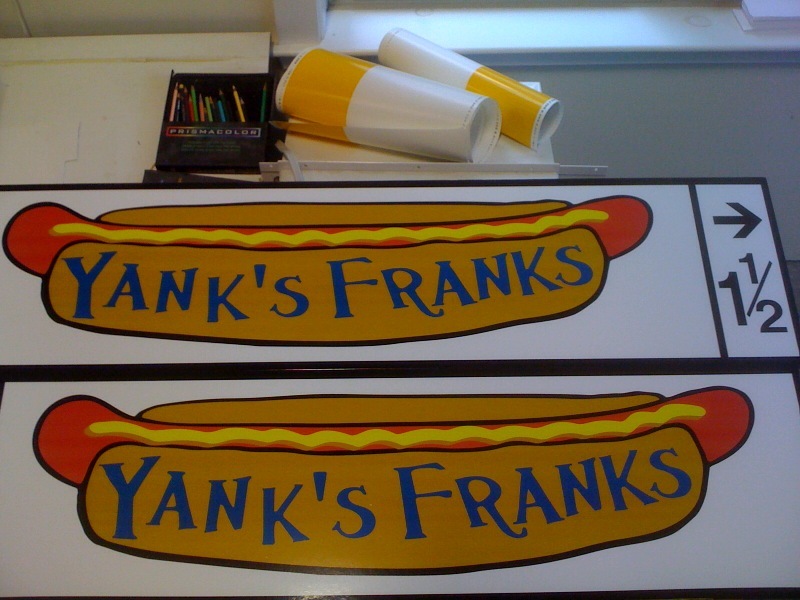 At Yank's Franks, we can't wait to get started. Our current plan (and it is subject to change) is to open for the season on May 21st. We will open weekends only until June 25th. Starting June 25th, we plan to be open 7 days per week from 11:00 am until 3:00 pm. We expect to return to the weekend schedule after Labor Day. That's the current plan and we really are looking forward to getting started. I can taste the chili dogs melting in my mouth right now. One last thing...here's a sneak peek at something we are considering. We may be selling Yank's Franks tee shirts that will more than pay for themselves. More on this to follow. Frankly, we can't wait to get started on our 2011 Hot Dog Season! 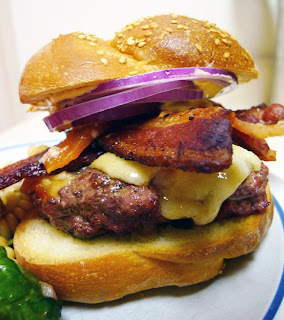 Here is a new offbeat blog that will seek out (among other things), America's best hamburger. 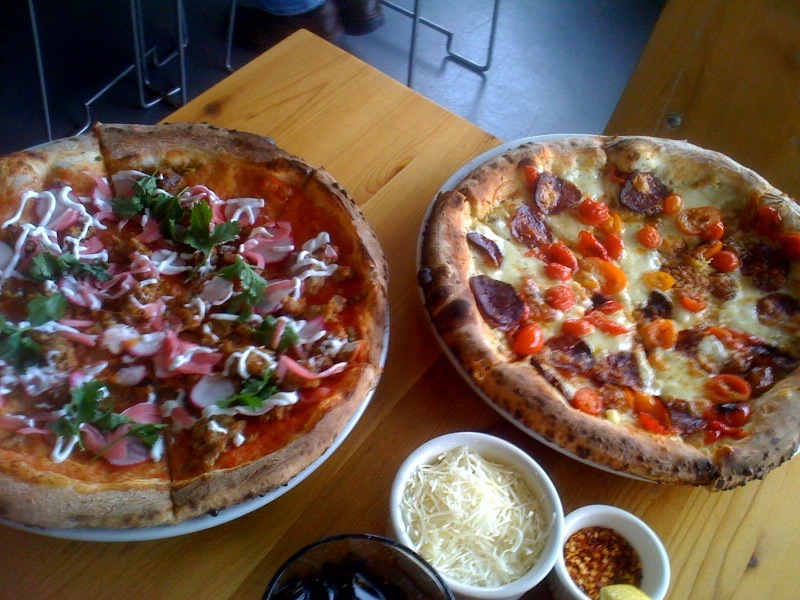 The photo to the left accompanied Chubby's review of a Portland, Maine restaurant named Local 188. 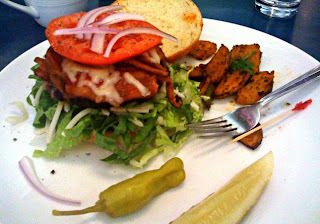 Go to Chubby Werewolf's blog to see how this Local 188 Brunch Burger stacks up against others. Chubby himself made an appearance at Yank's Franks back in early October. He arrived unannounced and never identified himself until he wrote a great online review of Yank's Franks. Thanks, Chubby! For insight into Portland's pop culture, reviews of popular movies, life in Maine, and my favorite, the hunt for the perfect cheeseburger (only one thing could be better...the hunt for the perfect hot dog) visit Chubby Werewolf's site and check back often, it's full of great ideas.